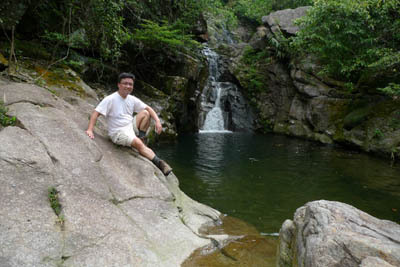 This stream is one of the Nine Big Streams in HK. 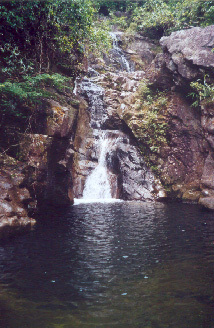 It earns its reputation by numerous sizeable clean water pools and waterfalls. Relatively speaking, this stream is easily accessable. In sunny summer time, there are a lot of visitors. Let's begin our trip now. We have a big gang this time. 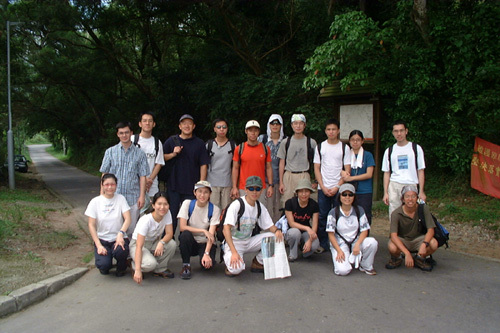 This photos is taken on Luk Keng Road at which you can find a concrete road leading to PingNan stream. This dam is the front door of this stream. 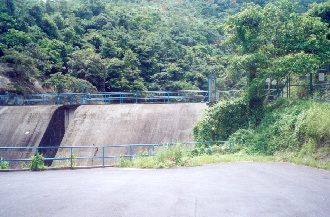 There is a metal gate on the right of the dam. On the right side of the gate, there is a faint footpath that takes you to the stream. 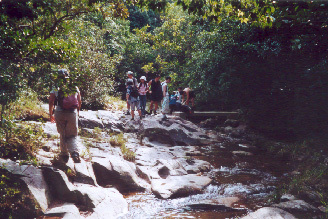 Your water-fun hiking trip is about to begin. After a short while, you will be greeted by this nice fall. Although the pool is not very wide, it is very enjoyable. There is a very very deep cave beneath the waterfall. Check it out. Here is a deep wide pool. Want to dive in? Wait! There are better ones waiting for you a few steps away. This fall is named Hula Fall (草裙瀑). It is like a giantic Hula of 10+ meter tall. This fall pour water into a relative shallow pool. There is a faint path on the right to take you higher. 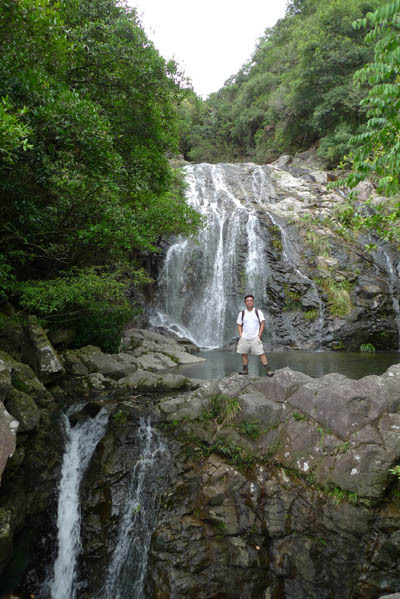 Right on the top of Hula Fall is the famous Old Dragon Pool (老龍潭). This is the widest water pool in PingNan stream. This pool is wide and deep. Being surrounded by three rock walls, the pool looks dark green. It is an ideal place for taking rest. Potholes are common features in the area. 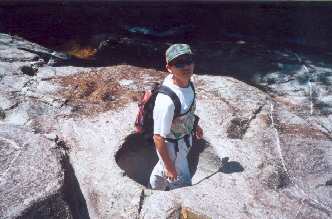 Here is a big dry pothole that could bury half of your body. 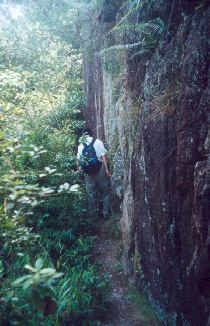 At 145M, you will meet the first exit of the stream. 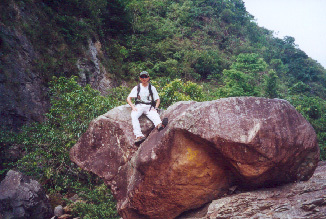 This rock is called the Fat Pig Rock (肥豬石). It has distinctive pig head, pig nose, pig ear and pig body. 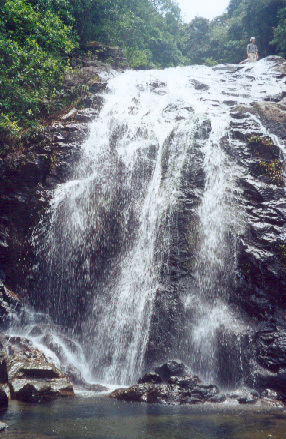 It is called the Double Falls(雙瀑). 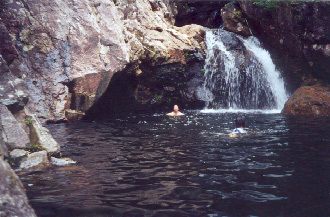 The upper fall fills up a deep icy water pool. Since the pool is of several meters deep and the water is running fast, the pool is kept cool even in burning summer time. Take your time here, this would be the last sizeable water pool in this stream. 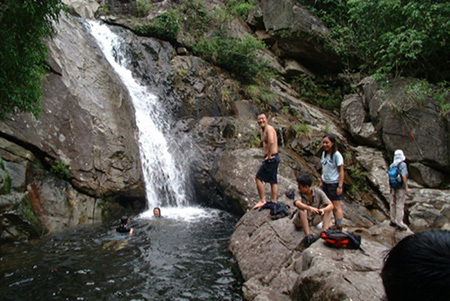 After the Double Falls, you will encounter a series of small pools and falls which are collectively known as the Nine Consecutive Pools (九疊潭). At this height, you will meet the second exit of stream. Although the stream itself extends behond the second exit, proceeding along the stream will be rather demanding.